Will Evans and Alyssa Jeong Perry win the May Sidney Award for “Tesla says its factory is safer. But it left injuries off the books” published by Reveal from the Center for Investigative Reporting. 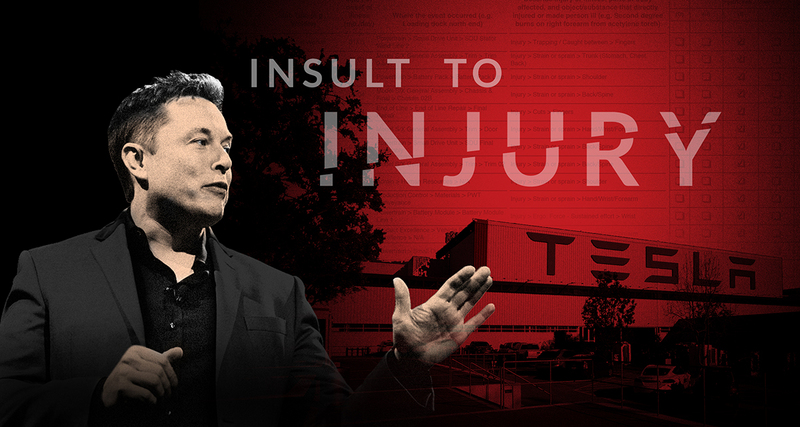 The exposé sparked a government investigation into Tesla’s injury reporting practices. It also provoked a bizarre Twitter outburst from CEO Elon Musk who dismissed the story as “b.s.” and “propaganda,” prompting analysts to accuse Musk of taking a page from the Trump playbook. Workers at the Fremont plant have been lacerated by machinery, hit by forklifts, scalded in electrical explosions, and sprayed with molten metal. Tesla is legally required to report all workplace injuries that require medical attention beyond first aid or force an employee to miss work, but Reveal/CIR documented a pattern of undercounting significant injuries. Tesla added 13 injuries to its official casualty list for 2017 after Evans and Perry began asking questions about undercounting. These include lacerations that forced an employee to miss more than one hundred days of work and a knee dislocation that has kept the worker off the job ever since, but the count still doesn’t include all the injuries Evans and Perry uncovered in their investigation. Reveal/CIR spoke to dozens of current and former Tesla employees, including five former members of Tesla’s environment, health and safety team, who said that production speed and aesthetics routinely trump safety. Some ex-Tesla workers said that collisions between workers and heavy machinery could be reduced if pedestrian paths were clearly marked off in yellow. Currently there are two different shades of grey, separated by white lines. Former safety team members said they were discouraged from using yellow, the standard safety color, because Elon Musk didn’t like it, since it departed from his sleek grey, white and red color scheme. Will Evans is a reporter covering labor and workplace issues at Reveal from The Center for Investigative Reporting. Prior to joining CIR in 2005, Will was a reporter at The Sacramento Bee. This is Will’s second Sidney Award. Alyssa Jeong Perry is an audio reporter at KPCC (formerly with KQED in San Francisco). Her stories have aired on NPR, WBUR’s Here & Now and PRI’s The World. Alyssa has a master’s degree in journalism from the UC Berkeley Graduate School of Journalism. Q: How did you decide to investigate the safety record of Tesla’s electric car factory? A: After hearing complaints about safety in the factory as part of her reporting for KQED, Alyssa did a public records request for all the OSHA citations against Tesla and the investigation notes in those cases. Alyssa brought that to Reveal, where she teamed up with Will to pore over the records and dig deeper, reaching out to current and former employees. Once we started talking to former members of the safety team, it became clear there were serious systemic problems. Q: How does Elon Musk’s management style contribute to the safety problems at Tesla? A: We were told that senior managers were afraid to stand up to the CEO, which created an atmosphere where people didn’t push to fix safety problems or were shot down when they did. Musk’s name was often used to justify shortcuts or dismiss concerns. “If someone said, ‘Elon doesn’t like something,’ you were concerned because you could lose your job,” one source told us. Also, it was well known on the health and safety team that Musk didn’t like the color yellow in the factory, or the beeping sound that forklifts make when backing up. So they cut down on those safety signals – sometimes disabling the beeps when Musk was around and painting over yellow or not using yellow paint where safety professionals thought it should be used. Q: How did you go about cultivating sources inside the Tesla plant? A: We contacted people who had filed workers’ compensation claims (you can get names and records on this from the state Division of Industrial Relations), injured workers mentioned in OSHA records, and people who had filed lawsuits. We also reached out to current and former employees (including members of the health and safety team) by phone or social media, like Facebook and LinkedIn. Lots of the people we talked to referred us to other people who worked there. Q: How do we know that Tesla is under-counting workplace injuries? What do you make of the company’s defense that all injuries are assessed by third party medical professionals to determine if they are workplace related? A: We obtained internal Tesla records showing how the company tracks and labels worker injuries – and compared them to Tesla’s official legally mandated injury logs, which employees requested and provided to us. Many injuries were internally described as being clearly work-related but then labeled as a “personal medical” issue – part of what one former safety professional called a systematic mislabeling that kept the injury count artificially low. Tesla said those injuries were assessed by “third-party” medical professionals (though that includes medical professionals at the on-site Tesla health clinic and those at Tesla’s preferred outside clinics.) But we dug deeper and found medical records that disproved that. We found cases where the Tesla-referred doctors diagnosed work-related injuries and prescribed medication for them – and those still weren’t counted. We also now know (from subsequent reporting) that Tesla added back some injuries from 2017 after we began raising questions – though not all of the missing injuries. Q: What would Tesla’s safety stats look like if all the omitted injuries were counted? A: That’s the problem – we don’t know. Tesla’s injury rate went from being 30% higher than the industry average in 2016 down to the industry average (6.2 injuries per 100 workers) in 2017. After we started asking questions, Tesla added back some injuries to its 2017 logs, making its official injury rate 6.3, slightly higher than average. But those are the official numbers, and we know they are an undercount. We don’t know what the numbers should be, and that makes it hard to assess Tesla’s safety record. Q: What did you learn from this investigation that you will carry forward to future investigations? A: Reporting this story really reinforced the importance of documents and deep sourcing. The company pushed back hard, but we had records and sources to back it up, so we could be confident in the findings. For any worker safety story, these are great records to check out: workers’ compensation cases, 911 logs, OSHA investigation files, and Form 300 injury logs that can be requested by any current or former employee.